Look like a superstore with PrestaShop, fulfill like a logistics champion with ShipStation. ShipStation, the leading web-based e-commerce shipping solution, announced today that it has become a premium Partner for PrestaShop, one of the top global online shopping carts. With a focus on Europe, PrestaShop is ranked #8 in e-commerce platform market share for the UK, according to Datanyze. The UK is the most evolved and competitive e-commerce market in Europe. Deepening this partnership with one of Europe’s top e-commerce platforms is a critical step for ShipStation’s expansion into new markets, most recently seen with the company’s integration with Royal Mail. With the availability of ShipStation in PrestaShop’s Module store, the #1 shipping solution provider in North America now becomes the obvious choice for PrestaShop merchants in the U.S., UK, Canada, and Australia. ShipStation not only imports orders from all relevant sales channels like - PrestaShop, eBay, or Amazon globally and over 150 other carts and marketplaces - it also manages inventory, provides time- and money-saving features and makes shipping with multiple carriers a breeze. This broad value proposition - starting at just $9 (U.S.) per month with no set-up or per-label fees - makes ShipStation a unique offer within the PrestaShop Module Shop. Additional ShipStation features that PrestaShop sellers will have access to include branding options, such as branded labels, packing slips, tracking page and even a Branded Returns Portal, to elevate the online shopping experience. ShipStation also gives users the ability to set up Automation Rules which automatically populate customs forms and generate the best shipping rate, based on geography and product. On the go? The ShipStation mobile app, free on iOS and Android devices, allows sellers to manage and view their ShipStation accounts on their phones. 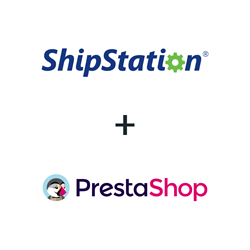 Check out ShipStation’s partnership with PrestaShop today and sign up for a free trial. ShipStation is the leading web-based shipping solution that helps e-commerce retailers import, organize, process, and ship their orders quickly and easily from any web browser. ShipStation features the most integrations of any e-commerce web-based solution with over 150 shopping carts, marketplaces, package carriers, and fulfillment services. ShipStation's many integration partners include PrestaShop, eBay, Jet, PayPal, Amazon, Etsy, BigCommerce, WooCommerce, Shopify Plus, Squarespace, and Magento; along with carriers such as FedEx, USPS, UPS, Canada Post, Australia Post, Royal Mail, and DHL. ShipStation has sophisticated automation features such as automated order importing, custom best practice rules, product profiles, and fulfillment solutions that enable its users, wherever they sell and however they ship, to be exceptionally efficient at shipping orders. ShipStation is a wholly-owned subsidiary of Stamps.com (Nasdaq: STMP). For more information, visit http://www.shipstation.com. Founded in 2007, PrestaShop delivers an open source e-commerce software that offers an efficient, powerful, flexible and innovative platform. Today more than 270,000 e-stores in 195 countries operate under PrestaShop. PrestaShop’s mission is to work side by side with the e-merchants to grow their business and give them all the tools to be the most successful possible. PrestaShop has offices in the USA and France. PrestaShop can rely on the Country Managers to shine on an international basis. As a vibrant company, PrestaShop is part of different ranking, including the Inc. 5000 2017 list (which includes rapidly growing private companies in Europe) and won the People's Choice CMS Award for best SME e-commerce solution. For more information, visit https://www.prestashop.com/en.